Written by: PSMJ Resources, Inc. Up-and-coming project managers at architecture and engineering firms are often frustrated by how hard it is to “win work.” That’s because "trying to “win work” doesn’t work. If you don’t know where to begin, apply these six simple rules and start improving your hit rate. What’s this person looking for? How does the client view the consultant? Is this a client that respects the contribution of the consultant, where the consultant is a true extension of staff or does this client view what we do as a commodity to be sourced from the cheapest vendor? What is your relationship with the client? How does he/she view you, are you a “trusted advisor” or just one of the stable of consultants out there? Know it better than the client. Where are the pitfalls? Where can this get off the track and how can you keep it moving? Convey your sense of passion for the project in the proposal. Convey your ideas and thoughts about the project that will simply not leave you alone. The converse of this “Rule” is that if you aren’t passionate, “fugettaboutit,” you won’t win. Steve Jobs was not in the computer business, he was in the business of enriching lives by providing life essentials before we even knew we needed them. Ask yourself/team: “What are we going to provide our client/community by doing this that they did not even knew they wanted?” Then sell the sizzle. Clients are busy and (trust me on this) don’t have the time or more importantly the desire to wade through pages of deathless prose. If it ain’t easy to read and comprehend, it will be disregarded. Looking for more tips on effective business development? 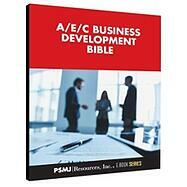 Check out PSMJ's complimentary ebook, The A/E Business Development Bible, a concise overview of the essential “must-knows” of business development, direct from PSMJ’s marketing and business development experts. Should Your Firm Have an Unlimited Vacation Policy? If you’re like most architecture/engineering (A/E) firms, you allow each employee somewhere between 10 and 20 vacation days (2-4 weeks) per year, depending on their seniority (and..
Offering a competitive compensation package is certainly a crucial component of effective recruiting, but the first step is to identify the best practices and most effective..
PSMJ Resources, Inc. announces the launch of A/E/C RecruitMAX, the first conference to address the unique employee sourcing and onboarding challenges faced by the A/E/C industry..